You will receive both of these magazines from the 1970's. 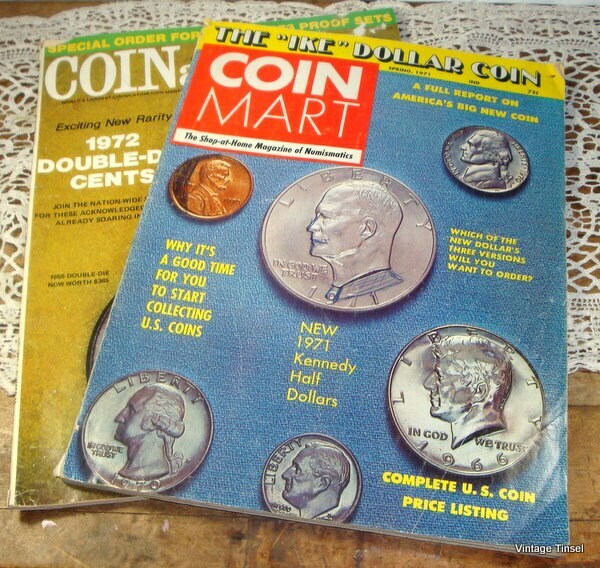 CoinMart is dated Spring 1971, Coinage is October 1972. Full of articles and a great reference source. Learn about the "Ike" dollar coin, Double-die cents, true value of Peace dollars and how "proof" coins were born. Magazines show storage wear and minor creases and small rips. Spine intact and all pages clean and present. No offensive odors. More coin collectors magazines, combined shipping available. Shipped media mail unless an upgrade is requested.